ID Quantique introduces the world’s smallest true Quantum Random Number Generator (QRNG) chip, developed by our partner SK Telecom for security, IoT and critical infrastructure applications. Based on a technology concept and patent from IDQ, and designed and manufactured by SK Telekom, the Quantum RNG Chip harnesses true quantum randomness from the shot noise of a light source captured by a CMOS image sensor. The breakthrough derives from the use of low-cost–off-the-shelf components, such as a CMOS image sensor, LED and ASIC, which allowed for significant miniaturization and cost reduction of the technology. The Quantum RNG Chip is ideal for use in the IoT, critical infrastructure and security applications where compact size, low cost, low power consumption and resistance to external environment perturbations are critical. SK Telecom is the largest mobile operator in Korea, with almost 30 million mobile subscribers. The company not only leads innovation in the field of mobile network, but also provides IoT, media, home and platform services. 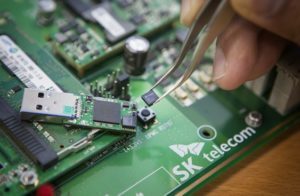 SK Telecom also established a Quantum Tech. lab in 2011 to develop quantum cryptography. It succeeded in developing a telco-grade quantum cryptosystem based on its own core technologies, such as high-speed single photon detectors. For more information, please visit www.sktelecom.com/en.